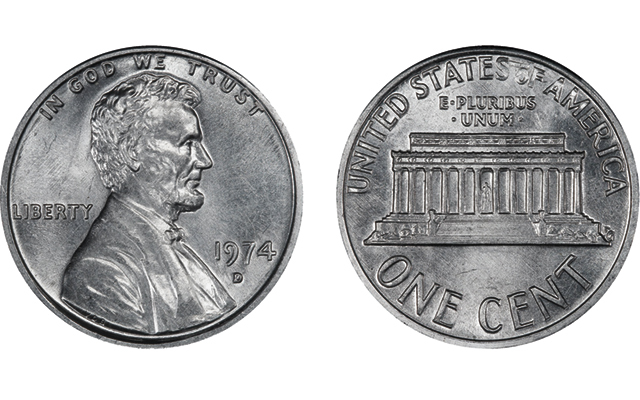 The argument is over a 1974-D Lincoln cent made of aluminum that was to be auctions by Heritage Auctions during the April 2014 Central States Numismatic Society auction. Rather than being auctioned, the U.S. Mint requested its return as government property even though it was reported that no records of the coin’s production exist. According to an updated report appearing in Coin World, the coin was given to Harry Lawrence, a former Denver mint assistant superintendent, as part of a retirement gift in 1979. Upon his death, his possession were willed to his son Randall Lawrence. Randall Lawrence and Michael McConnell, a San Deigo-area dealer working with Lawrence, consigned the coin to Heritage in hopes to be able to donate at least $100,000 from the sale to charities helping the homeless in San Deigo. Heritage had estimated the coin to be worth $250,000. Lawrence and McConnell are asking the federal court to determine the coin’s ownership. U.S. Mint does not have records of the aluminum cent being struck in Denver. There are records of 1 million coins struck in Philadelphia. Nearly all were destroy. The U.S. Mint’s mishandling of their own records are legendary. Some of the more famous coins that have escaped official record include the 1933 Saint-Gaudens double eagle and the five 1913 Liberty Head nickels. Numismatic researcher Roger Burdette has documented significant gaps in the way the U.S. Mint has historically mishandled their own documents. Even in recent years, the U.S. Mint has played fast-and-loose even with required documentation during previous director’s term because the narrative of the annual report would make the U.S. Mint’s performance look less than stellar. Unfortunately for the U.S. Mint, Coin World reporter Paul Gilkes was able to interview former Denver Mint employee Benito Martinez “who said he personally struck fewer than a dozen of these coins as a die setter on aluminum planchets provided by the Philadelphia Mint.” Martinez said that these coins eventually made its way to the U.S. Mint headquarters in Washington, D.C.
Aside from the bad precedent this would create for all pattern coins and trial strikes, this has the potential to undo whatever good will the U.S. Mint has built with the collecting public in the last few years. Problems with the Kennedy gold coin not withstanding, the work that the U.S. Mint has done after the departure of Director Edmund Moy to build a more collector-friendly can be undone by continuing this fight. Maybe it is time that the lawyers at the U.S. Mint and the Department of the Treasury stop trying to flex its muscles and realize the goodwill that would be created by changing policies and attitudes. After all, like all lawyers it is possible to interpret the law in a manner that would be more helpful while protecting the U.S. Mint and the U.S. government. Image courtesy of Coin World. Is anyone still wondering why so many Americans have very negative feelings toward the US Government? Here in NJ, a blogger reported that, after Hurricane Sandy left much of NJ without electricity, top officials in the county I live in, had their private homes powered with electricity from County owned generators. The County Prosecutor had them in court and demanded to know their sources claiming that they were not protected by the First Amendment to the US Constitution since they were bloggers, not journalists. A NJ Court ruled that the bloggers were protected by the First Amendment..
Hmm, I’m really torn about cases like these. On one hand, it is a 40-year fact span. On the other, if the government doesn’t start smacking people around on stuff like this, how does it avoid setting up a perverse incentive for continued “official larceny”. At what point does a stolen good become clean? If these were made available to the public for research and archiving, great! But private financial gain?!? Makes me queasy. You really do make a good point. But, in addition to what I said before, I want to add that there is so much big time crime in this country such as terrorist cells, organized crime, enough brutal murders to keep John Walsh busy for years and more that I think that the government should concentrate its resources on that and let some of this other stuff go.